Amazon.com description: Product Description: The ideas upon which public education was founded in the last half of the nineteenth century were wrong. And despite their continued dominance in educational thinking for a century and a half, these ideas are no more right today. So argues one of the most original and highly regarded educational theorists of our time in Getting It Wrong from the Beginning. Kieran Egan explains how we have come to take mistaken concepts about education for granted and why this dooms our attempts at educational reform. 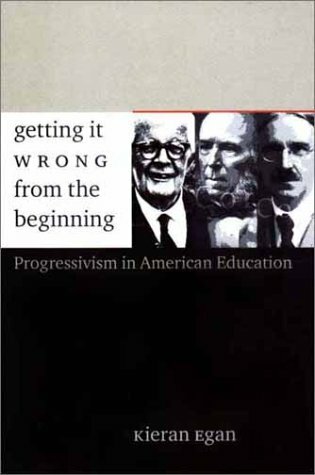 Egan traces the nineteenth-century sources of Progressive thinking about education and their persistence even now. He diagnoses the problem with our schools in a radically different way, and likewise prescribes novel alternatives to present educational practice. His book is both persuasive and full of promise â a book that belongs on the must-read list for anyone who cares about the success of our schools. About: The ideas upon which public education was founded in the last half of the nineteenth century were wrong.